"Ahhhh! I don't wanna get up!" That was my 3 year old grandson at 7am on April 19, 2012. I was sleepy also, but a promise is a promise. I had promised my friend that I would meet her at the site of the new 3rd Street Community Garden Project. I was determined to get there on time. The 3 year old exercised his lungs in protest for a few minutes to no avail. In the end, he came to the table and drank his milk excited about beginning the day in the park. Members of Green Team Englewood were on hand watching the work. The team donned gloves, Habitat for Humanity shirts and got a little dirty along with other volunteers. Volunteer workers were given coffee, muffins, water, gatorade and a Habitat shirt. Denise Dixon, a City worker showed up with her spade. She is a former Englewood resident and was glad to volunteer in the Community. 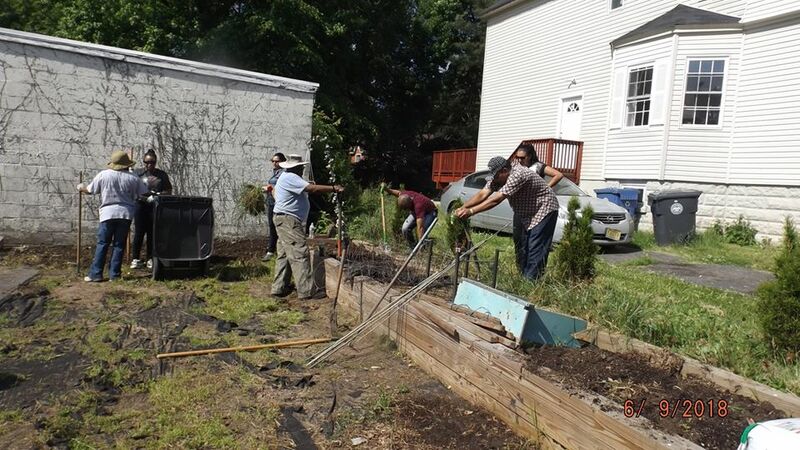 When we arrived, the volunteers from The Habitat For Humanity, United Water, State Farm Insurance, Business Volunteer Council, Volunteer Center of Bergen County, The City of Englewood, Joe Mironov, on loan from Sappi. Crystal Brown and the Green Team Englewood had marked off plots for raised bed gardens with twine. Wilbert Jackson, a volunteer from United Water did the prep work in tilling, cultivating hardy weeds and shrubbery. A soil mixture of peat moss and other organic matter was piled in the southeast corner, near the edge of the brook, waiting for the volunteers armed with wheelbarrows to move it to the beds. Carpenters were at work making wooden boxes for the beds. It was a concerted effort by a host of smiling volunteers. Third Street Bridge Crossing - I walked my 3 year old grandson home to his Mom's house on Genesee Avenue when I noticed that something about the site was making me feel uneasy. The garden plot is located at the end of 3rd street where the bridge across to Mackay Park has been closed and taken away. The closing and removal of the bridge has been a topic of discussion in the Community for some time now. We want to know why the bridge was closed off and subsequently removed. On a Photo walkabout last year, I noticed that the bridge that we had previously strolled or walked our children over to access MacKay Park had been closed. The view was not a welcome one so I failed to notice, at that time, that the bridge had actually been removed. Although the garden is a pleasant sight, many people may prefer being able to wheel the baby carriages into the park from their homes. It is ironic that easy access to a local Park is considered a plus when searching for real estate and a place to settle with one's family. I must raise the question. Would this bridge have been removed if the property was located in Dumont, Cresskill, Tenafly or even in the 1st, 2nd or 3rd wards in Englewood? The photo above demonstrates that there is a desire and a need to cross the brook at this point. Notice that a fallen tree has been propped up by a section of a tree trunk. This makeshift bridge is being used to cross the brook where the 3rd street bridge used to be. Will it be removed and the fence repaired after someone is injured crossing it? A fall from that ends in concrete meeting flesh and bone. What if a fire broke out on the corner of 4th street and 3rd street, where would the residents at the East end of 3rd street go to get away from the fire? There is no Eastern egress for the residents. They cannot go through the back yards. Into the Park, away from the flames was once and option. Do they lead their children into the brook now? the area where the fence is missing. Clear and Present Danger. Clyde Sweatt, Director of Public Works in Englewood and Steve Wissner, Englewood Green Team member and Director of Flat Rock Nature Center stand in front of a section of open area that poses a danger to children in the area. It appears that this section of the brook has never been fenced in. It is as if the contractors ran out of fencing and post before reaching the 3rd Street Bridge and just gave up. This area of fence should be installed immediately. The brush around the brook has probably concealed this danger spot for years. As a child, I was the one who would definitely be in the brook looking for fish and other water creatures. I would have climbed the make shift bridge pictured above no matter how much my mom and other adults warned me off. Both the unfenced area and the make shift bridge are "attractive nuisances" that should not exist. This neighborhood has a large number of children under the age of ten. We cannot fail to protect the children by allowing a site to exist that depicts "a clear and present danger." Again, this neighborhood has more children living and playing than any other I have seen in the entire City. Now Back to the Garden. 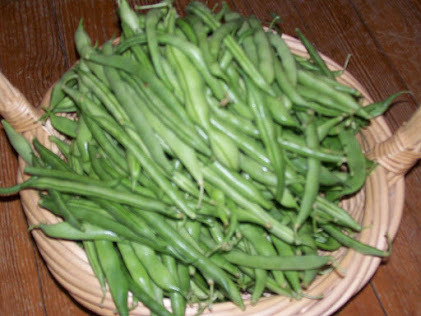 Raised bed gardening is a method of gardening that produces a much higher yield than rows. The theory is that the farmer never walks on the soil. Foot traffic packs the soil down making it more difficult for the plants to remove vital nutrients from the soil. Foot traffic discourages earthworm activity. These wiggly creatures help aerate the soil. I grew up on a farm in North Carolina. My grandfather and my father after him raised produce on raised beds. 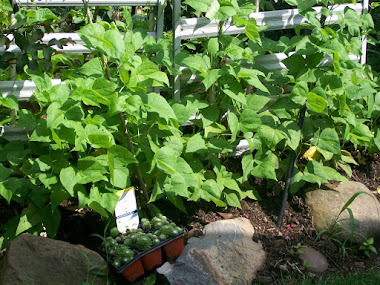 (boxes are not always required for the raised bed.) It is a well known fact among farmers that raised beds produce healthier vegetables and fruits and more of them. 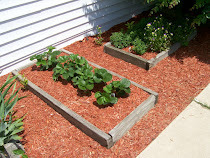 Cantaloupe, watermelon, blackberries, strawberries, blueberries, sweet potatoes and other produce that require good drainage grow well in raised beds. When I saw the width of the beds, I wondered where these lay farmers got their instructions for creating beds. My father used to say, "don't walk on my beds." He explained that walking on the soil packed it down and canceled out the whole reason for raising the bed in the first place. He used to make a fist and punch into the soil. He said that if one had tilled deeply enough and added the proper amount of organic matter then the arm could be inserted with minimum force up to the elbow. 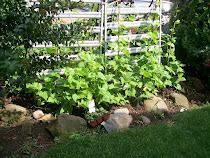 8' x 8' beds demand walking on the soil in the bed unless of course one is able to stretch like Mr. Fantastic from the Fantastic Four. It would have demanded more cuts, but eliminated problems in the future if the beds had been made 4' x 8' instead. This writer hopes that the creators of the garden abandons the idea of installing a chicken wire-like fence around the entire garden area and enclosing each bed with chicken wire also. The small animals will burrow right under the wood. Hint. Fences are a symbolic stop sign that scream, "stop, do not enter, you are not welcome here." A truck from Lowes arrived a little before midday and volunteers scurried about unloading the lumber. Lowes gave the 3rd street gardeners a discount on lumber. They also donated arborvitae trees for the buffer between the adjacent property and the garden. Let us hope that some long range thought has gone into who will maintain this fast growing evergreen that does not take well to topping and trimming. 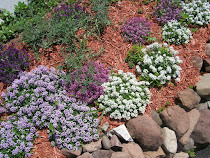 I have them in my yard and have considered moving them because they are shading out more desirable shrubs. 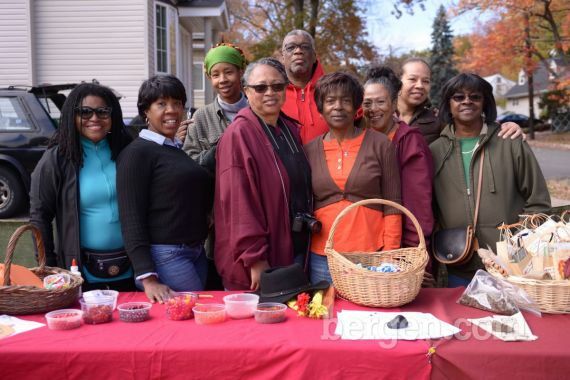 It is good to see local businesses get involved in helping to revive a Community. State Farm Insurance Company was a large contributor to the project. More emphasis should be placed on efforts such as these from higher levels in the Educational Community in Englewood, NJ. Otherwise, this seemingly well intended effort will be forgotten like a lot of others. 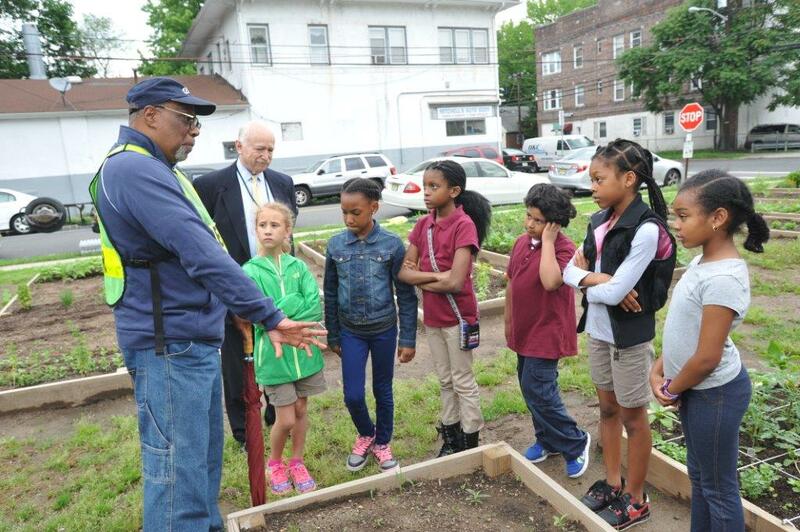 Dwight Morrow High School students might benefit from knowing that there are scholarships available for students who wish to learn the Science of Feeding The World. Agriculture Scholarships are available in institutions across the country. Until some other method of feeding the world is invented, farming is still highest on the list. New Jersey has been nicknamed the "Garden State" for a reason. 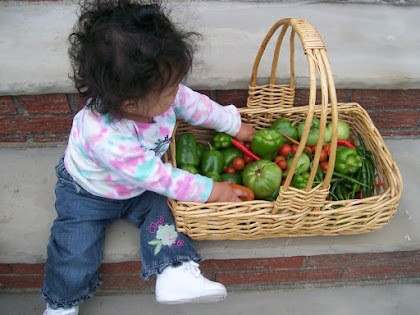 There is a lot of Science involved in growing healthy foods that are pest free and void of harmful chemicals. A career in Agriculture is a career choice that will never be replaced. A high School in NYC has partnered with Cornel University in order to Build & Enhance Sustainable Agriculture Technology. A quick read of Poor John's Farmer's Almanac teaches us that we must always plan ahead and by the moon. A water line will be installed by the City of Englewood at a later date in order to keep the garden watered. There was no explanation as to whom the bill would be mailed. Water is not free. A shed was assembled on site and will house the faucet for the water and other supplies needed for working in the garden. One hopes that this shed will be weighted down in some manner in order to prevent it from being blown into the brook. The plot is bordered by houses built by Habitat for Humanity and the Brook that separates this residential area of the 4th Ward from MacKay Park. Families are required to assist in the building of the homes. After being chosen in the selection process, each family must complete 400 hours of work on the future home. Habitat calls it "Sweat Equity." After being chosen, families work with volunteers and professionals in constructing the homes. Apparently the beds will be assigned to people in the Community. Several churches and the Janis E. Dismus Middle School have been promised beds. Seating has also been added to the area making it a nice place to sit. It is hoped that the brush to the south and east of the plot as well as north of the street will be maintained so as to discourage vermin and to create a welcoming atmosphere. Tall grass behind these seating areas adjacent to the brook might be a little scary. It is good to see that someone is going to make sure that the brush is cut. The area seemed terribly waterlogged today. It was a reminder that this is indeed a flood area. The aluminum shed is still standing but seems to have been moved several feet away from its resting place. May 16, 2012. I was very disappointed today. I dropped by the 3rd Street Community Garden to take a few more pictures before putting the final touches on my article. Check out the latest photos. Nothing like a chicken wire fence to welcome members of the immediate Community. 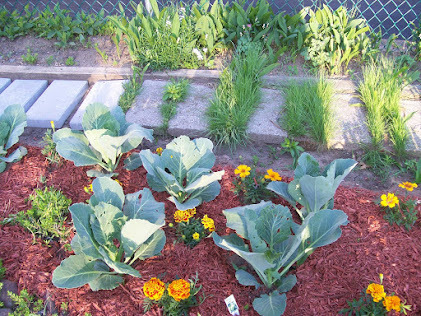 A Suburbanite article refers to Mr. Mironov as a master gardener and to the garden as contributing to feeding low income families. Did you ever hear about the old saying, "counting the chickens before they are hatched?" Any Master Gardener knows better than to promise something that does not exist. 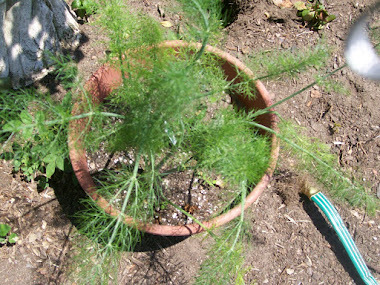 There are many events that effect the outcome of any garden in terms of production. Also, why did the master gardener design the beds for a giant with extra long arms (8'x8' across)? That Chicken wire fence around the entire garden is definitely a problem. The addition of a fence around the beds has made the look of the area a bit foreboding. I wonder if the fence would have been installed if the garden was located in another place, not in the 4th Ward. Just waltz on up into a neighborhood and install STOP signs. That fence says exactly the opposite to what the volunteers were saying with smiles on their faces as they worked. The fence does not say Welcome to the 3rd Street Community Garden. That fence says "KEEP OUT". Toys R Us or a similar business to donate a playground apparatus. Jacey Raimondo, Executive director, Habitat for Humanity of Bergen County was on hand working alongside the volunteers. This organization built the houses on both sides of the street that border the gardens. It is hoped that the area on the north side of the street be used as a playground since the entrance to the park has been eliminated. A Jungle Jim would be a sincere gift to the area. Gardening parents would be able to work in the garden while keeping an eye peeled on their children as they cavort in the playground. "are helping" a low income Community? The patch of green to the right is directly across the street and is also Habitat for Humanity Property. They have staked out their territory by hanging a banner on the fence. The entire length of fence on the North side of the street is covered in poison ivy. It should be removed. The people who installed the sign on the right are surely still itching if they were not wearing protective clothing, because the sign is flanked on all sides by this dangerous plant. Poison ivy is dangerous even in the winter time. Now that the space is cleared, it poses more of a nuisance, because it is more accessible to children playing in the area. It would be a sign of good faith and compassion for the children and might begin to atone for the demolition and removal of the third Street Bridge, if the lush green open space across the street from the garden was transformed into a playground. It would be pleasant indeed to visit the area to find residents casually watching their children play on a Jungle Jim while they garden or just sit and watch their gardens grow. To all Charitable Organizations: Remember that you are dealing with real living human beings who have a culture and Community of their own. Please do your due diligence and conduct a little research on the areas that you rehabilitate. Make sure that your arrival and continued presence is not considered an 'invasion' by long time residents. The help will be appreciated greater and for many more years as a positive experience. Please consider the points in the article as friendly discussion from a 4th Ward resident whose grandchildren live in the area. Thank you. Thank you Lucy for an unbiased accounting. Your reccomendations are based in experience as a gardner/farmer like myself and are spot-on. This is a real tragedy. I just heard that the 3rd Street Community Garden has been contaminated by a severe break in the sewer line while escalating with a backhoe. I am confused. It is a swamp. Why were they going through such mechanications to provide water? Raised beds and more immediate area Community involvement would have produced an Army of residents with a vested interest in growing produce. Now the land has to be left alone except for the growing of flowers. What about the brook?